Rain ends drought. And rain brings mosquitoes. So many mosquitoes. I was walking on a wet towpath. So many mosquitoes. Their little whining buzzing was continual, and too close to my ears. Their attacks were continual. It was so humid, I sweated off the first coat of Ben’s 100 in 20 minutes, and took to walking with the bottle in hand. I hate putting poison on my skin, I hate strong odors. Why was I doing this? I didn’t know, but figured it for something in the Apiaceae, so I took a few pictures and looked it up later. Turned out to be cow parsnip, Heracleum maximum, a close relative of the plant everyone’s been fussing about. So there I was, enduring the mosquitoes. I found the plants, a nice stand of them, but sadly they were done blooming. Also they were largely guarded by walls of stinging nettles, so I’ll admit it: I didn’t even try to get good pictures. I got as close as I reasonably could, got a few shots, and then got the hell out of there. I really can’t overstate just how thick the mosquitoes were. 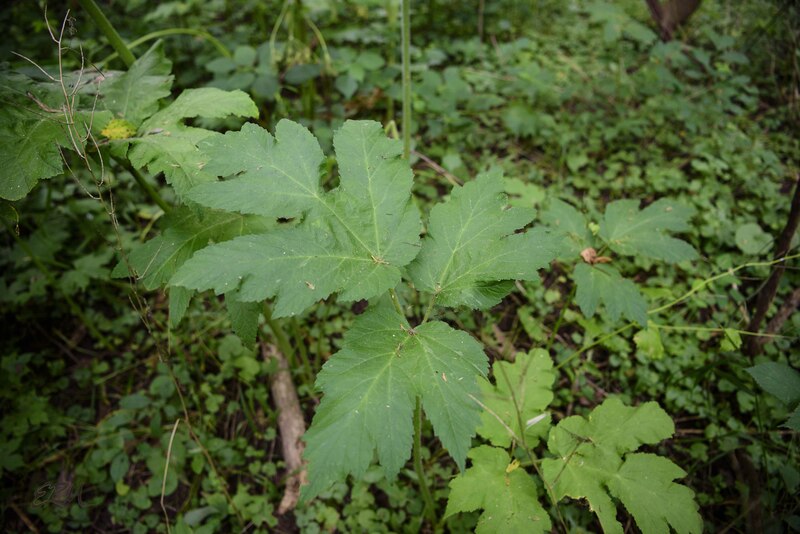 At any rate, cow parsnip, which is listed S3/watchlist in Maryland, is easily confused with giant hogweed. There have been a few sightings of the latter in recent years, but I understand that those plants were reported to the authorities, who removed them. I’d love to be able to post pictures of giant hogweed, but I’ve never seen it. I’ll consider that a good thing. The principal difference between the two is size, although that doesn’t help early in the season, when plants are still small. 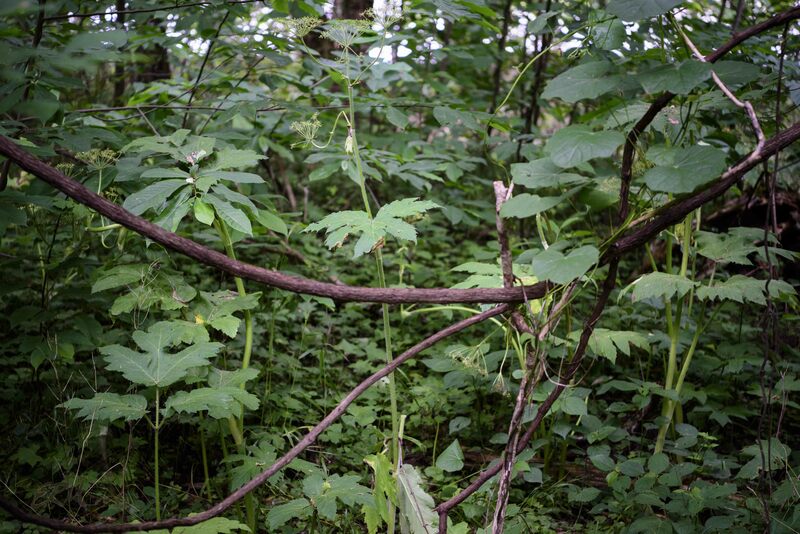 Giant hogweed grows to five and a half meters (18 feet!) tall, with a stem diameter of 15 centimeters (six inches). 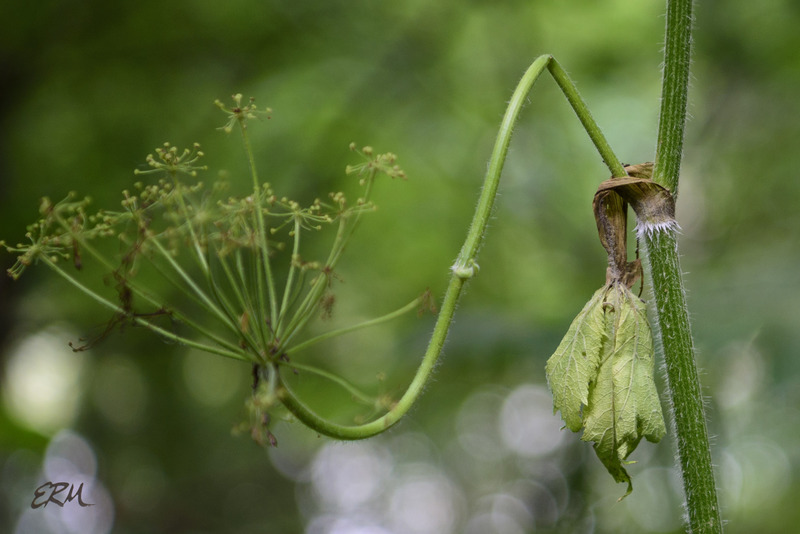 Cow parsnip grows to three meters (ten feet), with a stem diameter of five centimeters (two inches). The leaves and umbels are correspondingly sized (much larger on giant hogweed). The largest cow parsnip plants pictured above were about seven feet tall. A more useful way of telling them apart is to look at the lowest leaves. Both species have compound leaves. Cow parsnip leaves generally have three rather broad lobes, while giant hogweed’s are much narrower and often irregular. Also, the stems are different. Here’s cow parsnip; notice that but for the hairs, it’s solidly green. Giant hogweed stems have purple splotches. Both species have that ring of hairs at the nodes. I wrote about the poisonous aspects of these plants in this post. Remember, plants in the parsley family look a lot alike to the untrained eye. I’ve seen people mistake poison hemlock for Queen Anne’s lace, for example. Some umbellifers are tasty; others are deadly poisonous. Don’t mess around with them. Jil Swearingen and (possibly) Rod Simmons will be on the Kojo Nnamdi Show on WAMU between 12:30 and 1:00 on Tuesday June 26. The topic is invasive plants. It was inspired by recent reports of giant hogweed in Virginia. 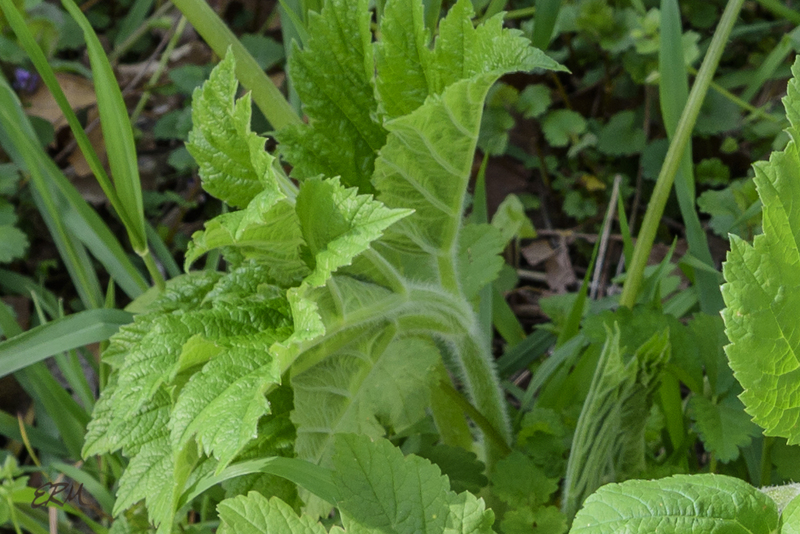 This entry was posted in Uncategorized and tagged Apiaceae, cow parsnip, giant hogweed, Heracleum, plant ID by elizabeth. Bookmark the permalink. 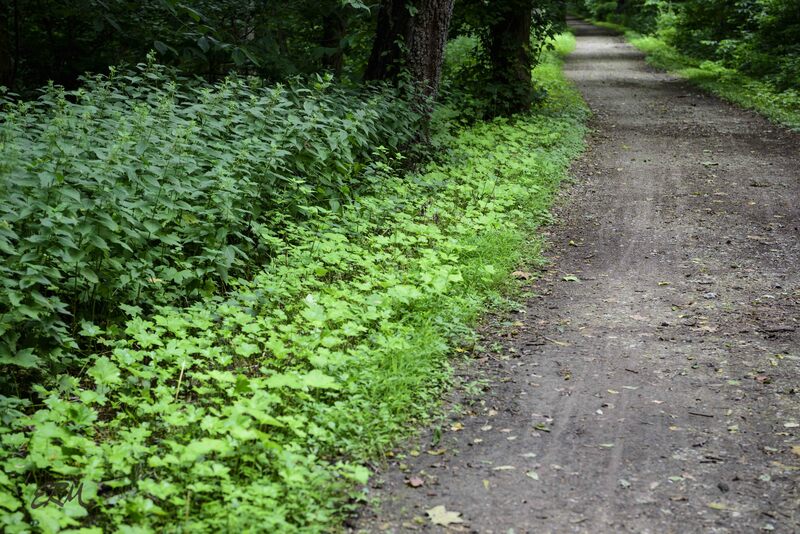 Those stinging nettles in that neat row look like they were planted and cultivated there, probably because the area had been cleared along the road earlier. Yeah, the mowers go along a few times a season. The light green plants that are lower to the ground are Hydrophyllum canadense.